"Brown in the Windy City"
Aggressive policing of ethnoracial boundaries happened among young men who physically kept “others” out of their community with street gang violence. Some Puerto Rican men remembered that if they passed through the Italian district, for example, they would invariably be beaten. In the summer of 1954, the conflict on the Near West Side was so heightened that it drew the attention of the secretary of labor of Puerto Rico, Fernando Sierra Berdecía, during his visit to the city. A “wave of violence and racial tension” erupted again between Italians and Puerto Ricans just four years later. Such tense relations occurred in other parts of the city as well. While we might interpret these conflicts as simply territorial rather than racial, historian Andrew Diamond has suggested that it was not just a sense of territoriality or “protecting the neighborhood” that motivated whites to employ violence to keep nonwhites out. Conflicts over space often carried explicitly racial meanings. If Italian Americans disparaged and harassed them, Puerto Ricans also faced battles on the other end of the color line. Puerto Ricans and African Americans did not always live in harmony either. The same young man who was reprimanded for eating by a window also recalled tensions with African Americans, in one case being chased by an African American teenager “swinging a chain with a padlock on it.” Puerto Ricans occupied a precarious social position and could potentially receive assaults from all sides. As the most recent group in the neighborhood and one with what anthropologist Elena Padilla called “color visibility,” Puerto Ricans learned that their place within the social order was still being worked out; it was contextually dependent and often based on one’s appearance rather than how one self-identified. Their racial ambiguity occasionally shielded them, however. One dark-skinned man recalled escaping trouble from Italians (although they were especially hostile toward Puerto Ricans) because they mistook him for an African American, a racial group that they were not looking to quarrel with at that moment. “Watchu say?” And it started all over again. Castillo’s poem reveals the enmity between some Italian American and Mexican American teenage girls that seemed to be part of everyday life. The narrator encounters problems at one of the local Catholic schools where both groups shared classrooms and came in direct contact with each other. Castillo points also to African Americans, who lived primarily in local public housing projects, and whom many Mexicans seemingly avoided. That the narrator carried a weapon also suggests an ever-present threat of violence. 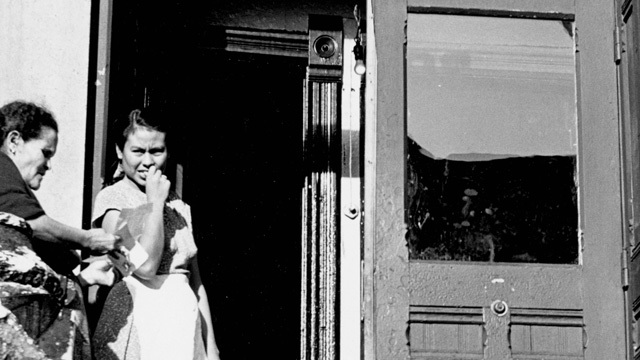 In reality, Mexicans negotiated complicated racial hierarchies in the neighborhood, seeking to distance themselves from whichever group was most disparaged at any moment and at times claiming a white identity alongside Italian Americans. Mexicans and Italians occasionally formed alliances against African Americans, but at other moments Mexicans sought to remain neutral in conflicts between Italians and African Americans. In an environment where a community’s integrity was often the only social capital that working-class residents possessed, ethnic and racial difference took on paramount importance. Despite the sometimes hostile climate, some residents did form close personal relationships across ethnoracial lines. Frank Paz noted in his study, “In spite of this feeling [of animosity] there have been a number of intermarriages between Italians and Mexicans.” Indeed, some Mexicans and Puerto Ricans intermarried with Italians as they did with African Americans as well. They also married one another. While some residents may have been more socially tolerant and open-minded than others, such unions did not always go uncontested by family and community members. In an environment where people encountered “difference,” negotiating space, resources, and social well-being could be complicated. Ultimately, each group had to look after its own, and interracial and interethnic alliances and cooperation more often represented the exception rather than the rule.